Royal Rumble (1993) was the sixth annual Royal Rumble professional wrestling pay-per-view (PPV) event produced by the World Wrestling Federation (WWF). It took place on January 24, 1993 at the ARCO Arena in Sacramento, California. The main event was a Royal Rumble match, a battle royal in which two wrestlers started the match in the ring; every two minutes, another wrestler joined. In total, thirty wrestlers competed to eliminate their competitors by throwing them over the top rope of the wrestling ring onto the arena floor. Yokozuna won the match and was awarded an opportunity to wrestle for the WWF World Heavyweight Championship at WrestleMania IX. Bret Hart also retained his WWF World Heavyweight Championship against Razor Ramon, and Shawn Michaels successfully defended his WWF Intercontinental Championship against Marty Jannetty. Royal Rumble 1993 consisted of six matches: four singles matches, one tag team match, and the Royal Rumble match. The buildup to the pay-per-view consisted of feuds scripted by the WWF's writers. Some of the rivalries dated back several years, while others were created specifically to create excitement about the Royal Rumble. The primary feud leading up to Royal Rumble 1993 was between WWF World Heavyweight Champion Bret Hart and challenger Razor Ramon (a replacement for The Ultimate Warrior, who had left the previous November). Ramon formed an alliance in late 1992 with Ric Flair, who Hart defeated to win the title belt. During an interview in which Hart was talking about the upcoming match, Ramon and Flair came to the ring and attacked Hart. Ramon later escalated the feud by attacking Owen Hart, Bret's brother. 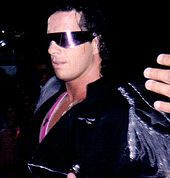 Bret Hart was the WWF World Heavyweight Champion going into the event. Another major feud featured at the event was between Shawn Michaels and Marty Jannetty, who had teamed for several years as The Rockers. The team split up in December 1991, however, when Michaels attacked Jannetty during an episode of Brutus Beefcake's interview segment, "The Barber Shop". Michaels became a singles wrestler and won the WWF Intercontinental Championship on October 27, 1992 from Davey Boy Smith. On the October 31, 1992 episode of WWF Superstars of Wrestling, Jannetty returned to the WWF after a lengthy absence and confronted Michaels. He attempted to hit Michaels with a mirror, but Michaels pulled his valet, Sensational Sherri in front of him. Sherri was hit with the mirror, which caused friction between her and Michaels. Michaels and Jannetty were scheduled to face each other for the Intercontinental Championship at Royal Rumble 1993. Leading up to the match, Sherri announced that she would be in the corner of one of the men, but she refused to say which one. In an undercard match, The Steiner Brothers (Rick and Scott), who made their WWF debut in late 1992, were scheduled to face the Beverly Brothers (Beau and Blake). There was little buildup for the match, but the Steiners and Beverlys had a rivalry over which was the best team of brothers in the WWF (although the Beverly Brothers are not related in real life). Several feuds also formed the background for the Royal Rumble match. Virgil had served as Ted DiBiase's servant and bodyguard for several years. DiBiase treated Virgil poorly, which eventually led Virgil to turn against his employer. At Royal Rumble 1991, he attacked DiBiase after a match by hitting him with the Million Dollar Championship, a title that DiBiase had awarded himself. Virgil defeated DiBiase for the belt at SummerSlam 1991, although DiBiase later regained the title. The Undertaker was feuding with manager Harvey Wippleman. He had a series of matches against Kamala in 1992 that included a bout at SummerSlam. The rivalry culminated in a coffin match at Survivor Series 1992. The Undertaker won the match, but Wippleman vowed revenge. Tito Santana and Rick Martel had formed a tag team known as Strike Force in 1987, and they held the World Tag Team Championship together for five months. Martel walked away during a match against the Brain Busters at WrestleMania V, leaving Santana to face both opponents alone. The team split up as a result and the former partners had a lengthy feud. Mr. Perfect served as "executive consultant" to Ric Flair in 1992, but the relationship broke down toward the end of the year. The partnership split up when Perfect teamed with Randy Savage to face Flair and Razor Ramon at Survivor Series 1992. Flair legitimately requested a release from his contract, as he felt he would be more successful if he returned to World Championship Wrestling (WCW). WWF owner Vince McMahon agreed and set up a feud between Flair and Perfect to create a storyline for Flair's departure from the company. Many wrestlers were scheduled to compete at the 1993 Royal Rumble but were either replaced or had left the company before the event. Those who were scheduled to compete were Doink the Clown, Crush, Hacksaw Jim Duggan, The Mountie, and Kamala. The event also featured the WWF debut of Lex Luger. Luger had previously wrestled in WCW, where he held the WCW World Heavyweight Championship. He had left the wrestling industry to join Vince McMahon's World Bodybuilding Federation (WBF). After the WBF failed, Luger signed with McMahon's WWF. Five matches with pre-determined results were shown on the pay-per-view telecast. In addition, Doink the Clown defeated Jim Powers by submission in an untelevised dark match before the event. In the first match shown as part of the broadcast, the Steiner Brothers (Rick Steiner and Scott Steiner) faced the Beverly Brothers (Beau Beverly and Blake Beverly). Scott gained the early advantage over Beau, both men quickly tagged in their partners. Rick performed a body slam on Blake and then tagged Scott back in, who threw Blake with a belly to belly suplex. The Beverlys regained the advantage and took turns attacking Scott's back. Blake performed a Boston crab hold to put more pressure on Scott's back and attempt to force him to submit. Scott escaped the hold and threw Blake to the mat by performing a Tiger driver. The Steiners capitalized on their advantage by keeping Blake in the ring and unable to tag his partner. Scott won the match for his team by pinning Blake after executing a Frankensteiner. The Big Boss Man faced Bam Bam Bigelow. In the next match, Sensational Sherri stood at ringside as Shawn Michaels defended his Intercontinental Championship against Marty Jannetty. She did not reveal her allegiance to either man. Jannetty gained the early advantage, knocking Michaels out of the ring and diving onto him through the ropes. He then attacked Michaels by jumping off the top rope, but Michaels countering this move by hitting him on the way down. Michaels hit Jannetty's shoulder against the ring post and focused on wearing down the shoulder once both men had re-entered the ring. Michaels missed an attack from the top rope, which allowed Jannetty to punch him repeatedly. Michaels recovered and threw Jannetty out of the ring, but Jannetty then suplexed Michaels over the rope and onto the arena floor. Sherri turned on Michaels by slapping him in the face, and Jannetty threw Michaels back into the ring with a belly-to-back suplex. Jannetty performed a powerslam and a DDT on Michaels. Michaels attempted to punch Jannetty but knocked the referee unconscious instead. Sherri came into the ring and tried to hit Michaels with her shoe. Michaels moved out of the way, and Sherri hit Jannetty instead. When the referee recovered, Michaels performed a superkick on Jannetty and pinned him to retain the championship. The third televised match featured the Big Boss Man facing Bam Bam Bigelow. Bigelow attacked Boss Man before the match and controlled the match's beginning by using power moves to wear Boss Man down. Boss Man performed two clotheslines on Bigelow to gain the advantage. Bigelow responded by throwing Boss Man with a belly to back suplex, and then threw him out of the ring. He wore Boss Man down with a bear hug. Boss Man briefly regained the advantage by suplexing Bigelow but eventually tried to run at Bigelow to crush him in the corner of the ring. As Boss Man approached, Bigelow kicked him in the face and followed this up by performing a diving headbutt from the top rope to win the match by pinfall. The next match was for the WWF World Heavyweight Championship, as Bret Hart defended the title against Razor Ramon. Ramon got the early advantage by punching Hart repeatedly but accidentally hit his knee against a turnbuckle while running at Hart. Hart applied a figure-four leglock to apply pressure to Ramon's knee. Ramon escaped the hold and threw Hart against a ring post; he capitalized on this advantage by attacking Hart's back. Ramon threw Hart with a fallaway slam and applied a bear hug. Hart escaped the hold by biting Ramon. He threw Ramon out of the ring and performed several of his signature moves, including a Russian legsweep and an elbow drop from the second rope. Hart applied the Sharpshooter, his signature hold, but Ramon grabbed the ropes, which forced the referee to instruct Hart to break the hold. Hart threw Ramon with a belly-to-back suplex, but Ramon responded by attempting to perform the Razor's Edge, his signature move. Hart reversed this into an unsuccessful pin attempt. With both men exhausted, Hart applied the Sharpshooter and won the match by forcing Ramon to submit. Before the final match, Bobby Heenan, a manager and commentator, unveiled his newest wrestler, "The Narcissist" Lex Luger. Heenan pointed out Luger's muscles and announced that Luger would carry on Heenan's rivalry with Mr. Perfect. The Undertaker was eliminated from the Royal Rumble by Giant González. The main event of the broadcast, the Royal Rumble match, came next. For the first time, a stipulation was added that the winner of the match would receive a match for the WWF Championship at that year's WrestleMania (a provision that has remained since). The match began with two former WWF Champions, as Ric Flair and Bob Backlund entered the ring first. Every two minutes, one of the remaining twenty-eight contestants entered the match according to the number they drew prior to the event. Papa Shango was the third wrestler to enter but was thrown over the top rope and onto the arena floor by Ric Flair, causing Shango to be eliminated. Virgil entered sixth and immediately attacked Ted DiBiase because of their long-standing grudge. When Mr. Perfect entered in the number ten spot, he and Flair fought each other until Perfect eliminated Flair by performing a clothesline to knock Flair onto the floor. Virgil was eliminated by The Berzerker, while Perfect was thrown out of the ring by Jerry Lawler, Koko B. Ware, and Ted DiBiase. The Undertaker was the fifteenth wrestler to enter; he eliminated four men before Harvey Wippleman appeared, accompanying a large man (who was later revealed to be Giant González, billed at eight feet tall). González attacked The Undertaker and threw him out of the ring; as a result, The Undertaker was eliminated from the match. Several referees tried to get González to return to the locker room; he eventually left, and Paul Bearer, The Undertaker's manager, came to the ring. He helped The Undertaker revive, and The Undertaker returned to the locker room to find González. Several minutes later, Typhoon entered the match, followed shortly by his tag team partner in The Natural Disasters, Earthquake. Earthquake immediately targeted Typhoon and eliminated him from the match. Earthquake tried to console his partner, who ignored him and left ringside. Later, Tito Santana and Rick Martel were in the ring at the same time; they fought each other immediately as a result of their five-year-old feud. Yokozuna, weighing over 500 pounds (227 kilograms), entered in the number twenty-seven spot; at one point, almost every wrestler worked together in an attempt to eliminate him, but they were unable to lift him. Former WWF Champion Randy Savage was the last wrestler to enter the match. The wrestlers fought and several men were eliminated in quick succession, leaving Backlund, Martel, Yokozuna, and Savage. Backlund eliminated Martel but was then eliminated by Yokozuna. Backlund was in the ring for one hour, one minute, and ten seconds, which set a new record for time spent in a Royal Rumble match. Savage gained the advantage over Yokozuna; he knocked him down and performed a diving elbow drop from the top rope. He tried to pin Yokozuna, although pinfalls are not counted during a Royal Rumble. Yokozuna pushed Savage off of him so hard that Savage flew over the top rope and onto the arena floor. As a result, Yokozuna was named the winner of the 1993 Royal Rumble match. During the match, he eliminated seven wrestlers, which broke the previous record for most eliminations in a Royal Rumble match. At WrestleMania IX, Yokozuna defeated Bret Hart to win the WWF World Heavyweight Championship. His title reign only lasted several minutes, however, as he dropped the belt to Hulk Hogan in an impromptu match. Yokozuna regained the title but dropped it to Hart the following year. Shawn Michaels continued his feud with Marty Jannetty. Shawn Michaels continued his feud with Sensational Sherri at WrestleMania IX. Sherri accompanied Tatanka, and Michaels countered this by introducing Luna Vachon, his new valet. After the match, Vachon attacked Sherri. The feud also continued between Michaels and Jannetty, as Jannetty defeated Michaels for the Intercontinental Championship on May 17, 1993. Michaels regained the belt in a rematch the following month to end the feud. Razor Ramon continued to wrestle in high-profile matches but achieved little success until changing his persona to a face after losing to the underdog 1-2-3 Kid in May 1993. As a fan favorite, Ramon won his first of four Intercontinental Championships in September 1993. The day after Royal Rumble, Flair faced Perfect in a loser leaves town match, in which the loser would be forced to leave the WWF forever. Because Flair had an agreement with McMahon to lose to Mr. Perfect before leaving the promotion, Perfect won the match and Flair did not appear in the WWF again until 2001 when he appeared as a co-owner of the promotion. With Flair gone from the promotion, Luger continued Heenan's feud and defeated Mr. Perfect at WrestleMania IX. The Beverly Brothers were unable to win the World Tag Team Championship, but the Steiners won the belts on two occasions in 1993. They feuded with Money Inc. (DiBiase and Irwin R. Schyster), who had held the belts since the previous October, before winning their first championship on June 14. Earthquake and Typhoon stopped teaming after their confrontation during the Royal Rumble match. No feud ever materialized, however, as Earthquake was released by the WWF and left to compete in Japan. The rivalry between Virgil and DiBiase was not mentioned again until the following year, when Virgil had a brief feud with Nikolai Volkoff, who was managed by DiBiase. DiBiase was reunited with Virgil, who had been renamed Vincent, when both men were members of WCW's New World Order in 1996. Luger's status as a heel (villain) was short-lived. Yokozuna issued a challenge for any American athlete to try to bodyslam him on the deck of the USS Intrepid on Independence Day that year. Several athletes made the attempt, but nobody was able to lift Yokozuna until Luger arrived in a helicopter and bodyslammed Yokozuna. Luger received a push and was given a match for Yokozuna's WWF World Heavyweight Championship at SummerSlam 1993, but he was unable to win the belt. The Undertaker's feud with Harvey Wippleman escalated in the following months and was featured at two more pay-per-view events in 1993. The Undertaker faced Giant González at WrestleMania IX; González was disqualified after attacking The Undertaker with a chloroform-soaked rag provided by Wippleman. Wippleman and González recruited Mr. Hughes, and the three men attacked The Undertaker and Paul Bearer. They stole The Undertaker's urn, which was said to be the source of his power. The feud culminated in a Rest in Peace match at SummerSlam 1993, which The Undertaker won to end the feud. Writing for Online Onslaught, columnist Adam Gutschmidt stated that the first half of the event is worth watching. He enjoyed the tag team match and the bout between Jannetty and Michaels. He also found the WWF World Heavyweight Championship match surprisingly good. He did not, however, feel that the match between Big Boss Man and Bam Bam Bigelow was interesting. He also disliked the Royal Rumble match because too many tag team wrestlers were included, there were few exciting moments, and Giant González did not help the match. Scott Keith reviewed the event for 411mania. He found the opening match between the Steiners and Beverlys to be boring. He enjoyed much of the match between Jannetty and Michaels but found the ending disappointing. He rated the match between Boss Man and Bigelow as a "dud" but enjoyed the WWF World Heavyweight Championship bout. He called the Royal Rumble match one of the worst in history, as he found much of the match boring and did not enjoy the debut of González. Overall, he rated the event as "mildly recommended". The event drew 16,000 spectators, who paid $187,000 in admission fees. This was down from the previous year's 17,000 fans but higher than the attendance for any of the following three Royal Rumble events. The pay-per-view buyrate of 1.25 was also lower than that of Royal Rumble 1992, which had a 1.8 buyrate. It was higher than the buyrates for all of the Royal Rumble events from 1994 to 1998, however. Royal Rumble 1993 was released on VHS by Coliseum Video on February 11, 1993 in North America. It was released on DVD in North America as part of WWE's Complete Royal Rumble Anthology on November 27, 2007. In the United Kingdom, it was released on VHS in 1993. On June 6, 2005, it was packaged together with Royal Rumble 1994 as part of WWE's Tagged Classics line for its United Kingdom DVD release. This was followed by the Complete Royal Rumble Anthology DVD set, which was released on October 15, 2007. ^ Sensational Sherri was in a neutral corner in the third match. A new entrant came out approximately every two minutes. ^ Giant González was not an entrant in the Rumble. This was his WWF debut. ^ Jerry Lawler was already eliminated when he helped eliminate Mr. Perfect. Bob Backlund broke the longevity record by lasting 1:01:10, previous records held by Ric Flair at 1:00:02. ^ a b c "Royal Rumble Event Results". Pro Wrestling History. Retrieved November 3, 2008. ^ Bret Hart talks Roddy Piper & Shawn Michaels. Aftermath. The Score Television Network. June 11, 2012. Retrieved July 19, 2012. ^ "WWF Superstars". WWF Television. Dayton, Ohio. December 12, 1992. Syndicated. ^ "WWF Superstars". WWF Television. Green Bay, Wisconsin. January 2, 1993. Syndicated. ^ a b c d e f g h i j k l WWF Royal Rumble 1993 (VHS). Coliseum Video. 1993. ^ Rote, Andrew (March 4, 2008). "Rock and rule". World Wrestling Entertainment. Retrieved October 27, 2008. ^ "History of the Intercontinental Championship: Shawn Michaels' first reign". World Wrestling Entertainment. Retrieved October 27, 2008. ^ "WWF Superstars". WWF Television. Saskatoon, Saskatchewan. October 31, 1992. Syndicated. ^ a b "WWE Alumni: Virgil". World Wrestling Entertainment. Retrieved October 26, 2008. ^ "SummerSlam 1991 Results". World Wrestling Entertainment. Archived from the original on July 31, 2008. Retrieved October 26, 2008. ^ Milner, John M. "Ted DiBiase". SLAM! Wrestling. Canadian Online Explorer. Archived from the original on June 4, 2011. Retrieved October 27, 2008. ^ "SummerSlam 1992 Results". World Wrestling Entertainment. Archived from the original on June 5, 2011. Retrieved October 27, 2008. ^ a b "Survivor Series 1992 Results". World Wrestling Entertainment. Retrieved October 27, 2008. ^ "WWF Superstars". WWF Television. Green Bay, Wisconsin. January 16, 1993. Syndicated. ^ "History of the World Tag Team Championship: Strike Force's first reign". World Wrestling Entertainment. Retrieved October 27, 2008. ^ WWF WrestleMania V (VHS). Coliseum Video. 1989. ^ Shields, Brian (2006). Main Event: WWE in the Raging 80s. Simon & Schuster. p. 139. ISBN 1-4165-3257-9. ^ Flair, Ric; Greenberg, Keith Elliot (2004). Ric Flair: To Be the Man. Simon & Schuster. p. 219. ISBN 0-7434-5691-2. ^ Reynolds, R.D. ; Alvarez, Bryan (2004). WrestleCrap and Figure Four Weekly Present the Death of WCW. ECW Press. p. 49. ISBN 1-55022-661-4. ^ Cawthon, Graham (2013). the History of Professional Wrestling Vol 2: WWF 1990–1999. CreateSpace Independent Publishing Platform. ASIN B00RWUNSRS. ^ "History of the WCW World Championship: Lex Luger's first reign". World Wrestling Entertainment. Retrieved November 3, 2008. ^ Reynolds, R. D. (2003). Wrestlecrap: The Very Worst of Pro Wrestling. ECW Press. p. 161. ISBN 1-55022-584-7. ^ a b c "WWF Royal Rumble 1993". Hoffco, Inc. Retrieved November 3, 2008. ^ a b c d e f g h i j Gutschmidt, Adam (June 2, 2005). "Royal Rumble 1993 Re-Revued". Online Onslaught. Archived from the original on December 8, 2011. Retrieved November 3, 2008. ^ Nemer, Paul (October 6, 2003). "ASK WV (10/6/03): Lawler/3 Knights, WarGames, Rumble Stipulation & More". WrestleView. Retrieved November 3, 2008. ^ "Royal Rumble: Facts & Figures". World Wrestling Entertainment. Retrieved December 29, 2008. ^ a b c d e f "Yokozuna (spot No. 27) wins the Royal Rumble Match". World Wrestling Entertainment. Retrieved November 4, 2008. ^ "History of the WWE Championship: Yokozuna's first reign". World Wrestling Entertainment. Retrieved November 3, 2008. ^ "History of the WWE Championship: Hulk Hogan's first reign". WWE. Retrieved November 3, 2008. ^ "History of the WWE Championship". World Wrestling Entertainment. Archived from the original on February 24, 2009. Retrieved November 3, 2008. ^ Mazer, Sharon (1998). Professional Wrestling: Sport and Spectacle. University of Mississippi Press. p. 140. ISBN 1-57806-021-4. ^ "History of the Intercontinental Championship: Marty Jannetty's first reign". World Wrestling Entertainment. Retrieved November 3, 2008. ^ "History of the Intercontinental Championship: Shawn Michaels's first reign". World Wrestling Entertainment. Retrieved November 3, 2008. ^ Conner, Floyd (2000). Wrestling's Most Wanted: The Top 10 Book of Pro Wrestling's Outrageous Performers, Punishing Piledrivers, and Other Oddities. Brassey's. p. 114. ISBN 1-57488-308-9. ^ "History of the Intercontinental Championship". World Wrestling Entertainment. Archived from the original on March 9, 2009. Retrieved November 3, 2008. ^ "Ric Flair – FAQ". WrestleView. Archived from the original on August 20, 2007. Retrieved November 3, 2008. ^ Kaelberer, Angie Peterson (2003). The Nature Boy: Pro Wrestler Ric Flair. Capstone Press. p. 43. ISBN 0-7368-2141-4. ^ "WrestleMania IX Results". World Wrestling Entertainment. Retrieved November 3, 2008. ^ "History of the World Tag Team Championship". World Wrestling Entertainment. Retrieved November 3, 2008. ^ Csonka, Larry. "Tribute to "Earthquake" John Tenta". Figure Four Wrestling. Retrieved November 3, 2008. ^ "Wrestling Challenge". WWF Television. Bethlehem, Pennsylvania. July 24, 1994. Syndicated. ^ Solomon, Brian. WWE Legends. Pocket Books. p. 167. ISBN 0-7434-9033-9. ^ Schramm, Chris. "Triumph and tragedy on July 4th". SLAM! Wrestling. Canadian Online Explorer. Retrieved November 4, 2008. ^ "Lex Luger vs. Yokozuna w/ Mr. Fuji for the WWE Championship". World Wrestling Entertainment. Retrieved November 4, 2008. ^ Powell, John (March 2, 2004). "'Mania's worst matches". SLAM! Wrestling. Canadian Online Explorer. Retrieved November 4, 2008. ^ "WWF Superstars". WWF Television. Halifax, Nova Scotia. June 12, 1993. Syndicated. ^ Reynolds, R.D. ; Bryan, Alvarez (2004). WrestleCrap and Figure Four Weekly Present the Death of WCW. ECW Press. p. 167. ISBN 1-55022-661-4. ^ "SummerSlam 1993 Results". World Wrestling Entertainment. Retrieved November 4, 2008. ^ Keith, Scott (July 28, 2002). "The SmarK Retro Repost – Royal Rumble 1993". 411mania. Retrieved November 3, 2008. ^ "WWE Royal Rumble – The Complete Anthology, Vol. 2". Amazon.com. Retrieved November 3, 2008. ^ "WWF Royal Rumble 1993". Amazon.co.uk. Retrieved November 3, 2008. ^ "WWE – Royal Rumble 1993/94". Amazon UK. Retrieved November 3, 2008. ^ "WWE – Royal Rumble: the Complete Anthology Vol. 2: 1993–97". Amazon UK. Retrieved November 3, 2008. ^ "Royal Rumble 1993". Pro Wrestling History. Retrieved April 8, 2011.